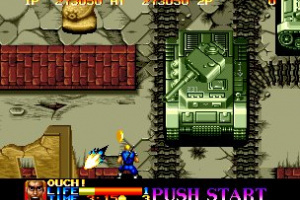 Ikari Warriors with ninjas - awesome! 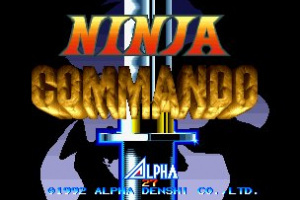 Ninja Commando is often confused for Ninja Combat or even its sequel, but in fact, it's neither. 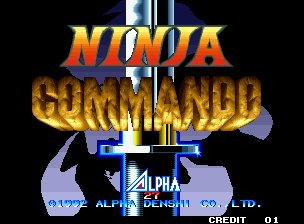 Ninja Commando is basically an overheard run 'n gun game that feels a lot like the arcade classic Ikari Warriors at times, although it doesn't quite have the same level of playability. 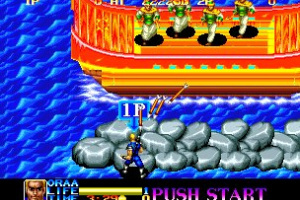 While the game is an earlier Neo Geo title, it's actually one of the better ones..
Ninja Commando is a vertically scrolling action game released by ADK in 1992. 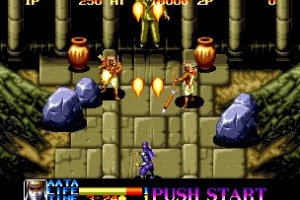 Players choose from among three ninjas - Joe, descended from the Koga ninja; Rayar, a woman who has learned the ways of the Iga ninja; and Ryu, descendant of the famous ninja Fuma Kotaro - as they pursue the merchant of death known as Spider, who plans to use a time machine to bring havoc to the world. 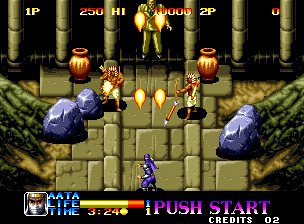 The battle spans seven time periods, including the Stone Age, the Egyptian era and the Japanese Civil War era. 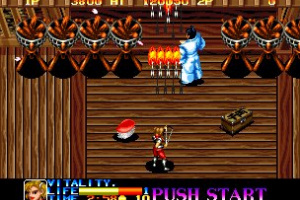 Each hero features a variety of attack options in addition to their own normal attacks, including a deadly attack that inflicts damage upon all enemies on the screen, special ninja-arts attacks performed by inputting specific commands, and a powerful attack unleashed by taking on the “shape of the beast” when three scrolls have been collected. 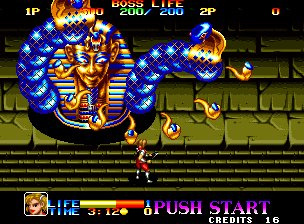 The game also supports two-player cooperative play, so you’re welcome to bring a friend and enjoy taking on the evil Spider together. Wow, this actually reminds me of Guwange. Sweet! 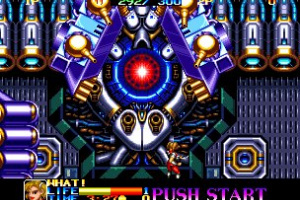 But on the other hand...Alpha Denshi isn't that great...so I'll wait for the review. 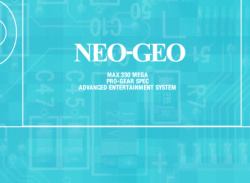 From this description, it sounds like a pretty cool game. Looks pretty cool, I just wonder if it's 900 Wii Points cool... 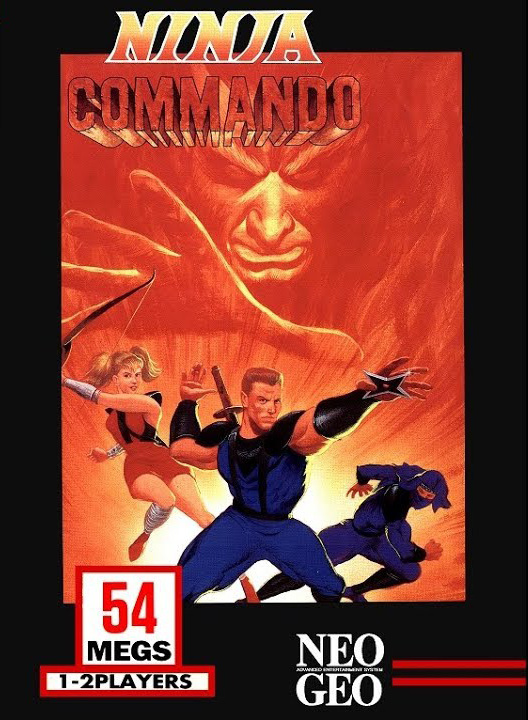 I mean, there are so many great action/shooter games to download for less on the VC right now, that, even if this game comes to the US VC, I wouldn't bother to download it. But, not a bad game from the looks of it! 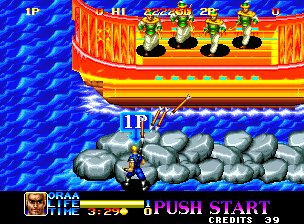 This is one of those Neo Geo games that I haven't played in a long time and dug it out of the closet to review it tonight and it all came back to me just how much fun it was. I can't believe I haven't played it in such a long time. If you like overhead run 'n gun games, you'll love this one. 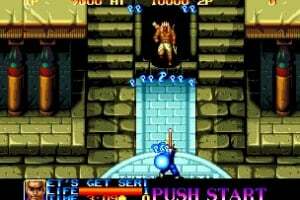 It would be nice if SNK would put out Guerilla War and POW for the NES. 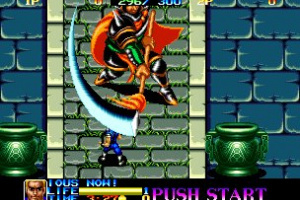 Its also a shame that Capcom's Mercs has been rated a while but has yet to make its VC debut. I hope we see this in NA soon. It looks awesome. 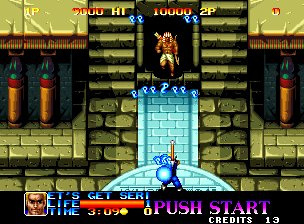 Also it looks like Ikari Warriors, a game way before my time that I always wanted to play. 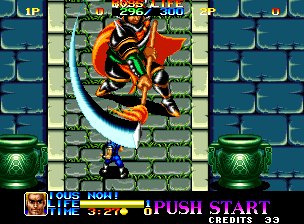 Edit: I'd probably have to get this too, since the NES version of IW was brought to us by the much-beloved Tengen. Don't wait, check this one out. It's a blast to play. 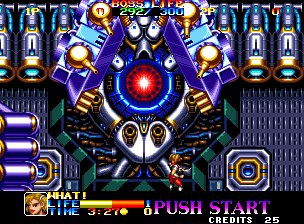 I should know, ever since I dug the MVS cart out to play on my arcade cabinet for the review, I've been playing it off and on since. Looks somewhat interesting. Not sure if I want this one though. Just got home and downloaded this one. Really fun to play. The bad translation is also a plus! Yeah! the translation's great! "Time has been reversed with Spider's plans. Go investigate and ruin his plans light now!" Ha! I also get a kick out of the in-game voices. "Habu-shiken!" Edit: Going further through the game, I found another amusing quote: "He's coming out. I'm excited!" I'll never get tired of that one! Just got this one - fantastic game. Hillarious translation as well. But dear god does you hand hurt after a couple sessions. 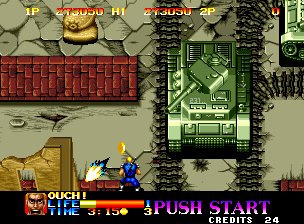 A game where ninjas are fighting Nazis is instantly a 5 in my books. The hilariously bad dialogue helps as well. 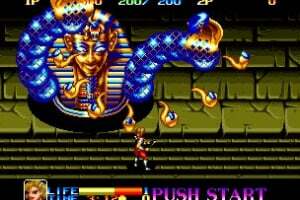 Awesome game is awesome, despite its flaws. Wrote a review for GameFAQs. It should be up within a day or so. 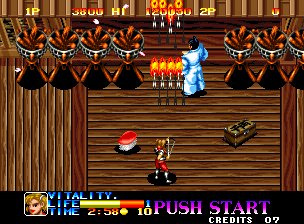 How does this game hold up against shock troopers? This youtube video had been removed by the user. Could we have a replacement video?